So, it’s Christmas again, and that means it’s time to bake something fittingly seasonal and rich. This year, that’s panforte di Sienna, an Italian dessert loosely resembling a cake that’s packed with fruit and nuts. Panforte originated in Sienna in the 12th century, and is supposed to contain seventeen ingredients, to reflect the number of districts in the city, but license may be taken. And it’s license that I’ll take, but around a fairly solid core. There must be nuts, and there must be fruit. 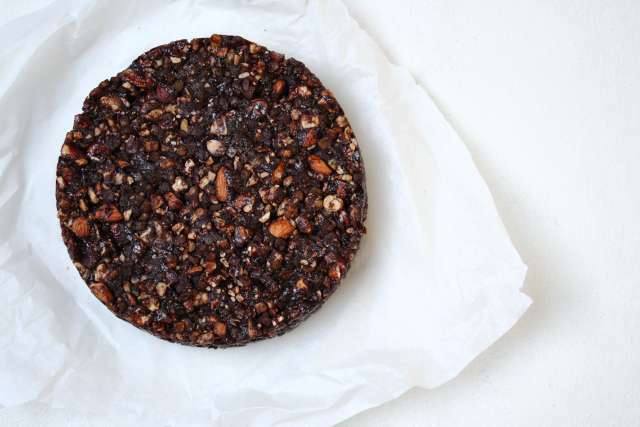 Panforte must be rich … honey, sugar, cocoa … and it must be spicy. Mine only totals about a dozen ingredients. It’s easy and quick to put together, and keeps very well in the fridge – up to a month. It’s best eaten in thin slivers with coffee or red wine. A panforte will last a long time. Start with 650g of nuts, roughly chopped. Peeled hazelnuts, peeled almonds, walnuts are perfect, but I have to confess that I settled for a bag of mixed nuts after quickly adding up the colossal cost of enough individual bags of the correct nuts (about £12) and realising that they cost about half the price. I wasn’t particularly fastidious about roasting or peeling them, either. My panforte consequently had a liberal dose of walnuts, and the odd cashew. It didn’t suffer for this. Combine about 450g of candied peel with the nuts, along with 150g of dried figs, chopped small. Sprinkle over 50g of cocoa, and 15g of ground cinnamon, and a total of 15g of a mix of ground cloves, white pepper, mace and coriander. Balance the flavours as you see fit, and remember that it’s the pepper that packs the punch, so bump that up or down in the mix accordingly. In a pan, heat 150g of honey and 200g of caster sugar together until they melt and mix, and then add the nut mixture and mix thoroughly. Tip the mix into a greased round springform cake tin, 20cm-ish in diameter, and bake in a 150c oven for thirty minutes. Remove the panforte from the oven and let it cool completely before removing from the tin, dusting with icing sugar if you want, and slicing with a heavy knife. Wrap the remains in greaseproof paper and refrigerate. A single panforte made this weekend should see you right through Christmas.